This report is intended as a best practices guide for faith communities, as well as for the professionals and advocates supporting them, as they attempt to develop or expand houses of worship in the face of organized grassroots opposition. 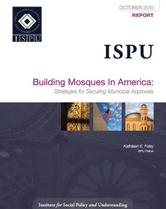 Recommendations are drawn from case studies of mosque development proposals made in the eighteen months immediately following September 11, 2001—arguably the most tumultuous period Muslim Americans had faced prior to the recent shockwaves caused by the so-called Ground Zero mosque, also known as the Park 51 development. Although the mosques examined in this report faced neither a nationally networked, hyperaggressive grassroots opposition movement nor the mainstream media glare that current mosque development proposals are encountering in the wake of Park 51, they were up against highly emotional responses as well as legitimate land use concerns. Key lessons from these case study mosques are distilled in this report.